Wayne Gretzky during the 1985 Western Conference finals. Wayne Gretzky, widely considered to be the greatest player in NHL history — so widely, in fact, that even Boston homers have to admit it (however tongue-in-cheek the manner) — was born exactly 55 years (and a day) ago. That’s really all the excuse we need to go spelunking in The Great One’s statistical treasure chest. Hockey stats, even the “advanced” ones, are famously lo-fi; even still, there’s a preponderance of evidence to confirm that Gretzky was far and away the most productive hockey player of all time. Yes, his teammates were outrageously talented. Yes, he played in an offensively inflated era, facing small goaltenders who employed archaic techniques. But even when we adjust Gretzky’s numbers for the scoring environment in which they were produced, nobody generated more goals — particularly with his playmaking — than No. 99. One of my favorite stats in all of sports history is that Gretzky could be the NHL’s all-time scoring leader even if he never scored a goal, on the basis of his assists alone. That’s not quite true after adjusting his stats for the era — Gordie Howe’s 2,190 adjusted points eclipses Gretzky’s 1,717 adjusted assists — but the difference between Gretzky’s adjusted helpers and those of No. 2 Howe is roughly the same as that between Howe and No. 28 Mats Sundin. The man’s hockey sense and vision were unparalleled. 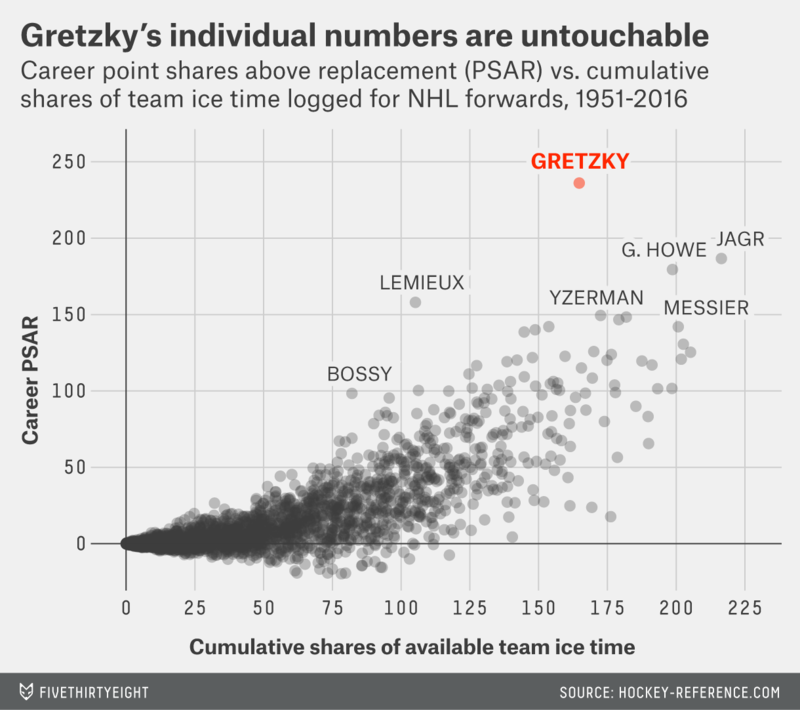 On an individual basis, Gretzky’s performance may never be topped — his next-closest active challenger by PSAR, Jaromir Jagr, would have to maintain his career rate of per-season production until age 50 just to catch The Great One. (Although … maybe we shouldn’t completely rule out that possibility.) But we can’t just leave it there — hockey is such a dynamic, free-flowing sport that a player’s individual numbers don’t always capture his contributions to victory. Some of that, as hockey quants have learned over the last decade or so, is due to the noise around infrequent events such as goals. Instead, on-ice shot margin (after adjusting for numerous contextual factors) is a sturdier gauge of team skill — and hence, an individual’s ability to influence it is an important consideration in modern player evaluation. We don’t have these fancy numbers for Gretzky’s career, but we do know his teams were probably not dominating possession, deriving their high-scoring offense instead from a high shooting percentage. Which brings us to Gretzky’s fabled ability to elevate the performance of his teammates. On a shot-by-shot basis, there’s some evidence that Gretzky’s otherworldly passing led to higher shooting percentages for his teammates than when they played without him. (At FiveThirtyEight, we’ve applied this with or without you — WOWY — technique before, to NFL wide receivers.) Among all players with at least 200 career adjusted assists, Gretzky ranks fifth in terms of hikes in teammates’ shooting percentages3 while playing alongside him, compared with the rest of their careers. Current stathead thinking suggests that only the most transcendent of passers can help a team sustain a sky-high shooting percentage, and the bread crumbs of evidence are there to suggest a real Gretzky Effect on his teammates’ numbers. Then again, it’s not clear how much of that can be untangled from the shooting percentage machine that was the 1980s Edmonton Oilers overall. Nos. 1 through 5 on the teammate shooting WOWY list all played for the Oilers during that era, so this might be more of a team stat, shared by linemates, than an individual metric. Further evidence: The Oilers collectively maintained a third-place finish in shooting percentage in 1988-89 (down only slightly from first in ’87-88), despite Gretzky departing Edmonton for LA over the summer. All of this is why, between absent data and changes to the fabric of the sport, deep analysis of historical hockey is inherently limited, despite our best efforts. We’ll never know Gretzky’s zone start numbers or have a player usage chart for his record-shattering 215-point 1985-86 season. But we can appreciate what numbers we do have from his career — and nobody produced stats more glamorous than The Great One. Going back to the 1950-51 season, the first season for which I have data. Indexed relative to the league average.